Hillside Lifts will walk you through each step from finding the proper location for the lift, providing accurate pricing, permitting and scheduling, installation date to the final inspection. We have worked with hundreds of clients and know exactly what it takes to create a satisfied customer. You will feel secure knowing you are investing in a top-of-the-line product that will last a lifetime. 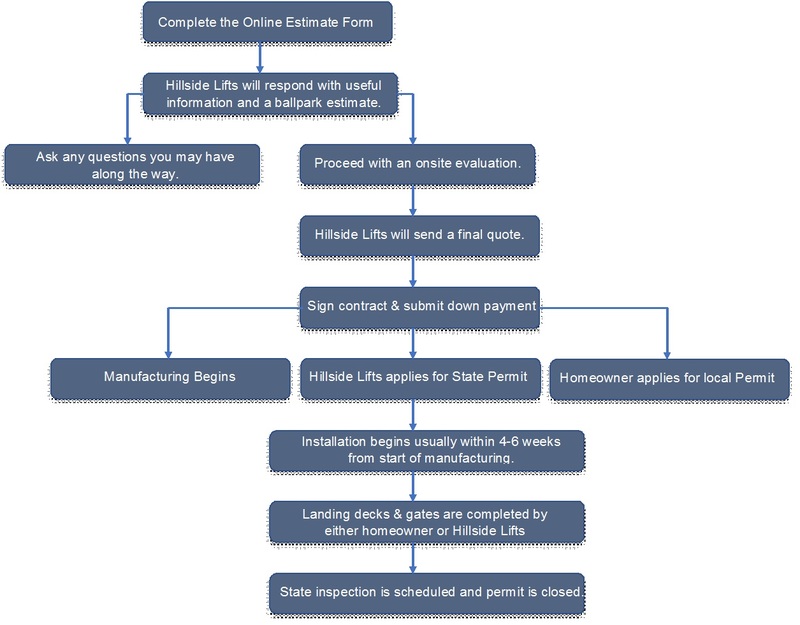 Here is the step-by-step process you can expect when you choose Hillside Lifts for your tram project. Complete the Request An Estimate Form, call or email us today so we can understand the general specifications of your hill. We will ask what the approximate length of your hill, if you have existing stairs and how many, an idea of the hill angle and soil conditions, and if you have any other special requests for your project. Hillside Lifts will provide you with a very close ballpark estimate for your project. The estimate will include the complete turn-key system with no hidden costs using industrial strength materials manufactured by Marine Innovations, Inc. All shipping, hill clearing, installation, sales tax, etc. will be included. Once you are comfortable with the ballpark estimate, we will schedule a time to visit with you onsite. At that time, we will find the perfect spot for the elevator and go over the specs of our system. We will answer your questions and show you other systems that we have installed in your area. Once back to the office, we will put a final quote together for you. After receipt of the down payment and signed contract, we begin the permitting and manufacturing of the system and schedule an installation date. In approximately 4-6 weeks, the crew will arrive onsite to complete the installation. The length of time it will take our crews depends on the project. Most installations are done within a weeks time. After the install is complete, the crew will show you the operation of the lift, provide you with an owner’s manual, warranty statement and contact information in case you have any further questions. Once your landing decks and gates have been built, we will schedule a final inspection (if applicable) with the State to close out your permit. Finally, you will choose a service plan so we can keep your lift running top-notch for years to come and you will feel comfortable knowing that you have just invested in the best incline elevator available on the market today!